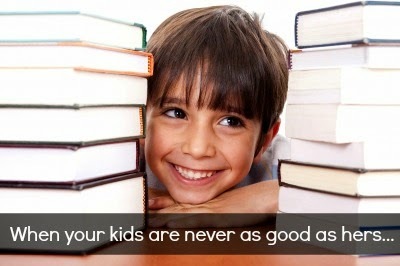 My homeschool NEVER. EVER. EVER looks like this. But, I have to admit, many--no MOST--days, I think everyone else's homeschool looks like this (well maybe like this pic with a ray of sunlight cascading across the spotlessly polished table and bird song and a fountain bubbling in the background). I especially believe that a smiling child hugging their books in a sunny Spring meadow is normal if I read too many curriculum catalogs, websites, and blogs. But we've been blessed to be a part of our church's homeschool co-op for a few years and there are some wonderful people who show me reality and talk me down from my curriculum catalog fantasy. One of those reality checks happened last week. "When I used to hear all the good things that other people's kids were doing I used to get so discouraged and compare my children because they didn't measure up to these other children. But through the years I learned that children are basically children wherever you go. And eventually I learned that usually, when you hear something out of the ordinary like children choosing to do amazing things, it was because their mom told them to, or encouraged them, and helped them do it." I really want you to get this... because this one fact here was a truth I didn't realize in all the younger years of raising my boys. It is NOT that most kids are amazingly insightful and mine aren't. It is NOT that all other kids have servant's hearts and mine are stunningly selfish and petty. Your kids are not broken or messed up because they hate math and occasionally (or daily) break down in snot-tears over it. They are not the only kids who snicker at their sibling's problems, or deliberately pick fights. Your kids are not the only ones who can't cut a straight line and paste correctly for the school project. They are not the only ones who get sent to the Principal's office for a melt-down of nuclear proportions. Don't accidentally absorb this lie and let take up prime real estate in your head. Don't talk to yourself like this. They are lies. From the pit. Yours, mine, and that kid above, who was getting paid to smile at his textbooks. We're all just doing this thing called life, the best we know how. We NEED to support each other. Speak truth to each other. TELL EACH OTHER ABOUT THE UGLY HARD STUFF you struggle with as well as the blessings. I can't even tell you how much closer I feel to moms who will honestly share their struggles. To know there are others out there who GET IT. Because even though I know no one lives a perfect, trial-free life, there are still those thoughts at the edge of my mind when I see families that never seem to have a problem, fight, or bad day. I bet you can think of one of those families right now too. But, we all have ugly. We live in a fallen world. Even THAT family has bad days and needs the grace of Christ and love of friends. Open up and be real. Share your struggles, share grace, share truth. That is living a brave life. I have one beautiful child who is particularly rambunctious at co-op and I find myself thinking (quite often) "why can't she be as well behaved as the other kids!". I struggle with her a lot and blame it all on myself. Thank you for writing this! Oh I so hear you! But as a friend wisely told me about my rambunctious one: don't wish that away. God needs men and women like that to serve him in a special way that only these personalities can! The big picture is fun to think about, but the days when you're living with it can last forever! That's such a good reminder. I've been thinking about this all week, it's still really hard, but you're right, God made her that way for a reason!